Trapped is a 17" functional maquette for a proposed full-size installation, although the maquette has proved so successful that I may never build the full version. 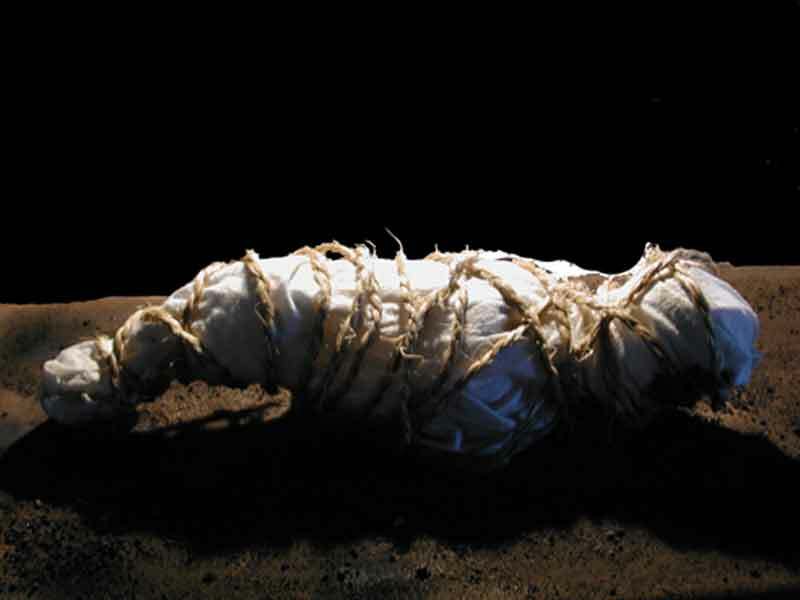 The concept is simple: A figure wrapped in dirty cloth and bound with ropes lies on a bed of ashes. It struggles to escape its bonds, and makes audible sounds. Originally it was not intended to be literally "figurative", but considerably less human in appearance. However, the materials seemed to struggle on their own to attain this final shape. For me this was a literal and practical example of the work telling the artist how it should be shaped (Knill and Levine 2005, Mulisch 1999). The internal armature of the piece consists of four servo motors controlled by a computer program written in C; later modifications intended to make the piece more portable replaced the computer and its C program with a PIC chip built into the base. The PIC runs a revised, streamlined program written in assembly language. The figure is not in continual motion. Rather, every few minutes it becomes exhausted, and stops moving for a while. Then it very slowly begins to struggle again, exhibiting a tentative "breathing" action. It's interesting to stand at a distance in galleries and watch people who first encounter the figure during its rest phase. When it begins to breathe, they describe their initial experience as creepy and disturbing. That's sufficiently close to uncanny for me -- which is the experience I intend the piece to evoke. To see a short Quicktime movie of Trapped in action, click here.